Infinite horizons...from this luxury, three bedroom, two and one-half bath condo! A peaceful, relaxing get-a-way is just a "click" away! A place to kick-back and enjoy a lazy day lounging on your your open-air veranda overlooking the sapphire-blue waters of the Atlantic. 1,800 sq. ft. of living area decorated in tastefully throughout with two master bedrooms with king beds and ensuites and a den converted to a third bedroom with a queen. Beautifully finished and furnished. 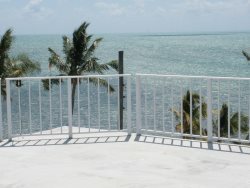 Come sit on our over-sized balcony and laze the day away watching the boats and the birds while soaking up the sun...THIS is why you come to the Keys! The diving is out of this world! For non-divers, the bird sanctuary and of course the sunsets! Staff was very helpful and friendly. I know they would have assisted with lightbulbs, etc. but we were busy running around during the day and whenever we thought to call it was after hours.